Our patient, a New Haven police officer, had tried every whitening system out there with no success. He was frustrated with the grey shadows and yellow color. We used the Kor Whitening system on him. No other treatment was rendered beyond Kor. We think the results speak for themselves. 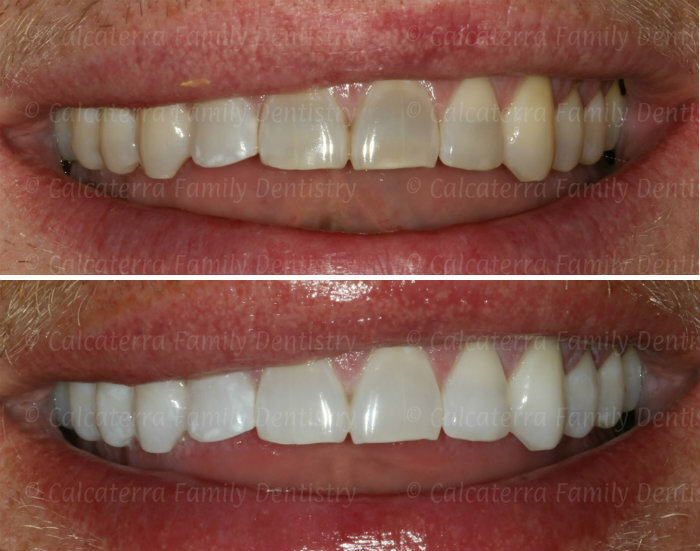 Photos and Kor Whitening done by Dr. Nicholas Calcaterra in our office in Orange. Note that many other offices have pages on Kor Whitening and then proceed to post before/after photos given to them by Kor. Keep in mind there is nothing wrong with that – but we feel it is a bit misleading and disingenuous. Achieving the above results (and the results seen in the stock Kor photos) requires skill, precision, and practice. Not all offices have made the investment in materials and training to achieve the results. We have. In our office, we jokingly call it “whitening on steroids.” While this may have a negative connotation associated with it, we feel it is accurate. Please note there are no anabolic steroids used in the procedure though! He/she was unsucccessful or unhappy with previous whitening attempts. What does Kor Whitening involve? Specialized impressions for custom fit trays (note these trays are WAY different than the trays used for traditional systems). An in-office visit to try-in the trays and to “prime” your teeth. At home whitening done by you. Each and every case is unique. We will discuss your previous whitening attempt and develop a customized Kor Whitening solution for you.